Hello my friends! It's official I missed last week's Simple Friday, and I was on such a roll. I have a good excuse though and I am not a bit sorry, well maybe. I We had to go on a little vacation that we've had planned since summer. Yes, when you book a vacation back in June you kinda forget about it until it hits you in the face. You see we have two special friends who turned 40 this past September and this month. To celebrate this joyous milestone we decided to take a cruise to the Bahama's. It was a 4 night/5day cruise departing from Miami to Nassau Bahama's, Coco Cay(Royal Caribbean's private island, and finally Key West. This was my third cruise and I have no complaints at all. The food was fabulous, and the entertainment was priceless. I We laughed and laughed until our stomach's hurt. We can't wait to go again, only three more years until I'm 40, hint hint honey! First stop the Bahama's where we all enjoyed a Segway tour around the island. It was a complete hoot! We had to do a tutorial to learn how to control these things and all I can remember is the tour guide saying "watch your wheels!" That was the joke the rest of the day. We had lunch at Senor Frogs and typical tropical weather it rained while we ate, perfect timing. After lunch me and the hubs hit the beach and then shopped up and down the streets with the hundreds of vendors. They are in your face too, so beware if you ever visit. Second stop.....Royal Caribbean's private island: Coco Cay. There is no port to dock the ship to so we had to take a tender boat into the island. The winds were definitly a problem, but we managed to get onto the island. I was so thankful because last time I cruised back in 2008 we couldn't make it into the island again because of the wind and being to dangerous. It was beautiful and so realxing. We had a BBQ style lunch on the island (all you can eat) not that we over endulged. How did Sponge Bob get here? My friend Lisa has this tradtion with her kids to take Sponge Bob on all vacations and get random pictures of him. Pretty cool picture!! My dear friends Carrie and Lisa.....I had to take some cool pictures and thought this was a neat idea. These are the rafts you rent for the day while on the island. Love you ladies! Pulling into Key West and back on US soil which meant we could use our cell phones again! I found out how dependent we are on technology, kinda scary. Good thing there was only one other boat at port, can you say Disney? I would love to do a Disney cruise, maybe someday. We decided to rent bicycles for the day, since Key West is only 2 miles long and 4 miles wide and we would hit the ocean eventually. It was a blast biking around the island and definitely a welcomed mode of transporataion. We were only on the island until 5:30, so we had to get a lot done with the short time we had. The Southernmost point of the United States, only 90 miles to Cuba! Finally the beach, ahhh! It was not easy to find the beach on Key West belive it or not. We hung out at the beach for about an hour and took in as much of sun, sand, and sounds of the waves hitting the shore. If I could bottle up that feeling I would and bring it out when we are stuck in cold, winter weather. Andrea! That cruise looks like sooo much fun! 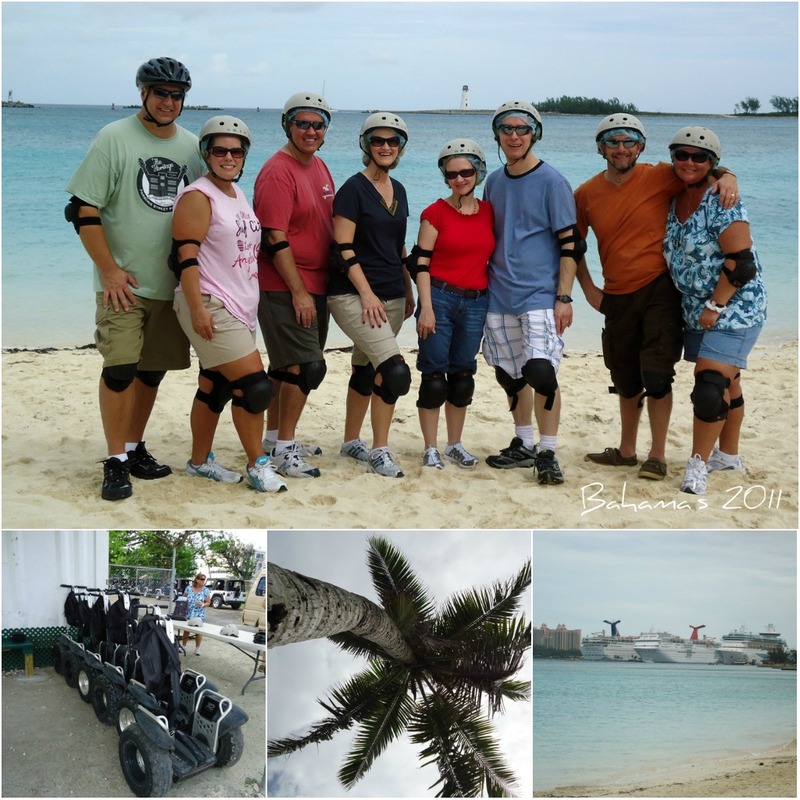 You guys look like you had a blast- I love the picture of the whole group wearing helmets and knee pads. I hope you get to do something really special and fun when it's your turn to turn 40 in a few years! I somehow missed out on a trip when I turned 40, so I think I'm overdue! Looks like you guys had such fun!! I love traveling with a big group like that. You have so many laughs and it's just so much fun. I want to go to Key West someday. Pretty pictures!